KMIS and Baby Lock had the pleasure of hosting Sue Hausmann on Saturday November 9, 2013 at the WUSF Studios in Tampa. We had a wonderful day of learning and fun. Sue took the time to share her experience and kind words with us. What a joy to be in Tampa with all our friends from Keep Me In Stitches and WUSF! We “sew” enjoyed working with Keep Me In Stitches owner, Melissa Helms, and her wonderful people as they organized a super day to benefit WUSF Public Media. Herb and I had never been to the WUSF studios on the USF (University of South Florida) campus before and their hospitality was fabulous. It was wonderful to visit with the President of Baby Lock at this special event. Steve is an amazing man and really knows the sewing business and is always looking out for what sewers and quilters want in their machines. I’m excited quite a number of you went home with new Baby Lock machines that day. We most enjoyed seeing all our sewing and quilting friends from the greater Tampa area and meeting many new friends too. Thank you “sew” much for your warm welcome and very kind comments about America Sews and all the projects and techniques you have learned over the last 20 years. Many of you said you felt I am your personal friend because you have known me for so many years and I’ve been “in your home” every week sharing the joy of sewing! Thank you for being my friend! I appreciate you! It was really fun to show you some of my favorite sewing notions and tools and some of the newest items that make our sewing and quilting “sew” much faster, easier and more fun! And it was very generous of Keep Me In Stitches to give quite a few of these new items as door prizes. But the real exciting prize was the final drawing for the fabulous Baby Lock machine! The winner could hardly believe she was going home with this $5000 Baby Lock! 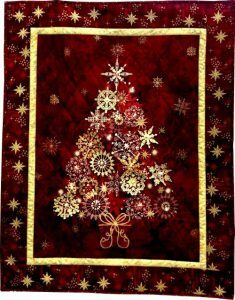 I loved all the fabulous classes and projects Keep Me In Stitches have coming up, especially the lighted Christmas Tree Quilt Wall Hanging! Melissa sent me two kits and my sister and I can’t wait to get started making them. Be sure to purchase your kit for this beautiful holiday wall hanging kit complete with lights and instructions at one of the Keep Me In Stitches stores or via their online store! Thank you again for the opportunity to come to share the joy of sewing in Tampa! Herb and I love bringing loads of tips and techniques and projects to you! We’re hoping to come back again soon! Thank you Sue, Herb, Baby Lock, and WUSF Studios for an amazing event!